If you missed last weeks Tuesday Post, I'm Guest Designing this month for Fire Cracker Designs by Pamela and will be sharing the cards I created in my Tuesday Postings. 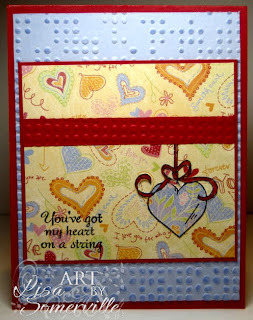 This week I've used images from Heart Strings to create my card. The Amethyst panel is embossed with a Texture Fades folder then highlighted with Amethyst Ink. 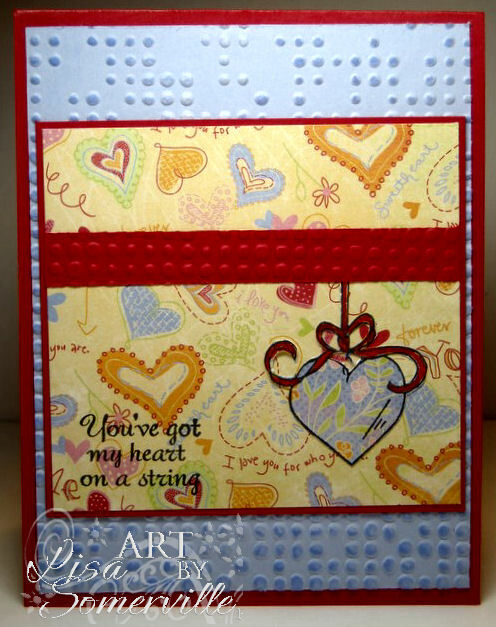 The Heart String is stamped on a piece of BG paper, then cut out with an Exacto Knife, and adhered on the Pattern Paper panel. I added a Red embossed strip over the string. The ribbon was colored with a Soufle Pen. Don't forget to check out this weeks Digi Freebie available through Sept. 21st. Be sure to stop by and read this post from Pamela, regarding the closing of Fire Cracker Designs and the Inventory Blow Out Sale that begins in October. Great card, sorry to hear that FCD is closing. Lovely card. The patterned heart against the background is so pretty.